The inhabitants of Roncal Valley in northern Spain have always responded to noblesse oblige, the idea that with nobility come obligations. (1) They were always present to defend either the Faith or the Crown. For this reason, the people of Roncal were granted special privileges, which they zealously maintained through the times. It is curious that even though their more distant acts of heroism are wrapped in the fog of myth and legend, the privileges derived from those facts have been carefully conserved to our days, something quite rare in modern times. Two privileges that still exist today originate from heroic battles fought by the men of the region. The first privilege is that all the people of Roncal are noble - knights, fidalgos and infants - with the right to use the shield of Roncal Valley. Still today, to become an armed knight in a military order, a man need only prove his last name is Roncalese to certify his nobility. At the least for seven months. Waving their kerchiefs in the air. What is the historical origin of these remarkable privileges? "And already in the times of King Don Fortuno Garcia, the Roncalese had killed and defeated the King of Cordoba called Abderraman, and pursued his army in a place named Olast. That King had killed King Ordoño of the Asturias and had passed through the Pyrenees to the city of Toulouse, destroying along the way the faithful Christians and the Catholic Faith. The Roncalese were known for their bravery and victories in defense of the Faith, and were always at the service of King Sancho Garcia [son of Don Fortuno], along with other valorous Catholics, who defended camps in the mountains and from there, extended the Catholic Faith throughout Spain. "For this reason, these Kings our predecessors, each in his time, recognized and declared the Roncalese to be, then, now and for always, free men and nobles, and that they should always enjoy the liberties, honors and prominence of nobles." In the 786th year of the Lord, Emir Abderraman, the great King of Cordoba, along with his Moorish army, passed the Pyrenees through the plains of Aragon. 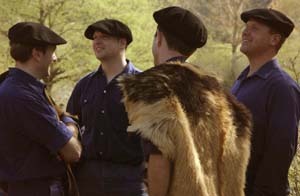 Horrified fugitives arrived at the Roncal Valley, describing the cruelties and massacres worked by those untamed African Moors during their passage. Abderraman’s forces went as far as Toulouse inside Gallia in that bloody expedition. On his return, the Moorish King decided to pass through the gorges of Roncal Valley to punish the inhabitants of the Valley who had up to that time wreaked destruction on all the Muslim expeditions. The Arab hordes came down from the Marks of France razing everything by blood and fire. Much smaller in number and power, the Roncalese gathered together in the solitude of the mountains while their villages were looted and burned. For the men, death seemed certain; for the women, slavery. Then, they determined to launch into battle, seeking a certain but glorious death. They descended from the mountains and attacked the infidels in large open fields close to Burgui, the very portal to Roncal, at the banks of the Esca River. In the place called Olast, or the fields of Burgui, they entered into a furious combat with the much superior enemy with the resolution to die valorously for the Faith. But God desired to assist the valiant Roncal people. Shortly after the fight began, as if by a miracle, the King of Navarre, Don Fortuno Garcia with some courageous columns of Navarre warriors arrived to help them. Knowing that the Moors were returning, this King had determined to make a punitive skirmish. His arrival coincided with the hopeless assault of the Roncalese. This providential encounter raised great jubilation in the Christians and equal astonishment in the enemies, who were ignorant of the number of the forces that were against them. The Moors made a hasty and disordered rush to exit the Valley. But now the men of Roncal had the advantage. They knew all the gorges and passages of the Sierra de Leyre, through which their famous valley winds. This allowed them to fall upon the center of the fugitive army in a surprise attack. Later, the vanguard of the Roncal army reached the village of Yesa on the borders of Aragon and entered the Arab royal quarters, where they took the Moorish King prisoner. While the men deliberated on a bridge over the destiny of Emir Abderraman, the women of Roncal approached the Moorish King and beheaded him. Hence, on a left quarter of the shield of Roncal is a bridge and, over it, the head of a Moorish king. The Roncalese all carry this shield as a sign of their nobility. 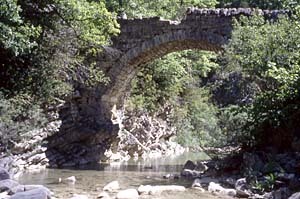 The Aragon River passes through Yesa under the ruins of a bridge known as the Roncalese Bridge. 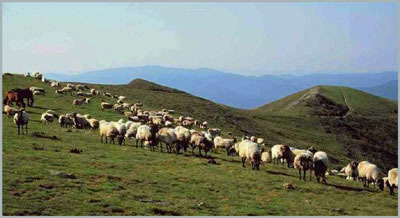 Another great and historical victory is the one that won for the shepherds of Roncal the perpetual right to winter their herds in the Bardenas Reales. 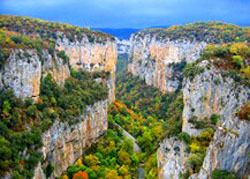 In the year 821, a strong Arab column advanced against fortifications in the Navarre mountains. King Don Sancho Garcia, son of Don Fortuno, went to meet it in the semi-desert region of Bardenas. Both the men with the King and his vanguard were Roncalese, who had earned this post of honor in the Battle of Olast. The two armies met at Ocharren, a small village in the territory. The victory of the Christians and the dispersion of the Moors were so complete that at that very site, Don Sancho Garcia granted the perpetual usage of that dry but fertile land, good only for pasturage, to the Roncal people. For more than 1,000 years the white column of flocks with the merry tinkling of their small bells travels up and down the Royal Trail, which links the pastures of Roncal Valley with the Bardenas. 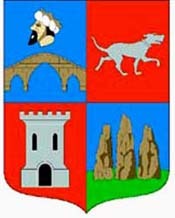 The Roncal Valley was the last region to be exempt from regular military service. In 1773, a royal decree of King Charles III established that names would be drawn for the draft in Navarre. The Royal Council of Navarre wanted to submit the Roncalese to the same law, but the people rebelled, refusing to renounce their privileges. The decree was revoked. As a counterpart to this right, the Roncalese took on the responsibility of being always ready to protect their borders at any moment in defense of the King and at the command of their mayor, the “captain-of-war" of the Valley. For this purpose their weapons were kept at their homes and every year they carried out a “display of arms” and military inspection made by the captain-of-war. Whenever the King would declare a war, the Roncalese would make it their own, manifesting in this way the Valley’s autonomy. Each year, during the Procession of the Virgin of the Castle, their patroness, through Roncal, when the cortege reaches a site that looks down over the whole Valley, the special militia who guard the statue stops and shoot their rifles, and the flag-bearer waves the banner over the Valley as a symbol of the dominion of the Roncalese over their land. 1. 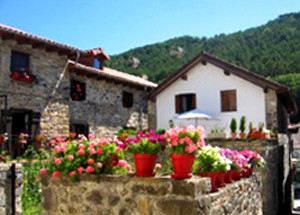 The Roncal Valley is situated high in the Pyrenees, on the border between France and the Spanish province of Huesca. It has a striking character and is alive with ancient traditions, delicious food and a pristine nature. Traced from north to south by the River Esca, seven villages of acclaimed beauty make up this valley, the main resources of which still continue to be forestry and livestock. 2. At this annual ceremony, the mayor of the Roncal Valley receives three cows from the mayor of Varetous Valley in France. This to commemorate an agreement dating back to 1375 ending hostilities between the people of the two valleys and granting certain trading privileges.